A recent Toronto Star exposé about the ordeals of temp workers gained a lot of attention in the media this month. 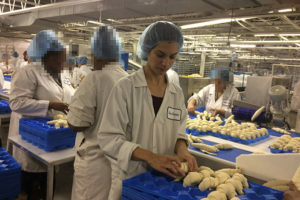 Reporter Sara Mojtehedzadeh went undercover at Fiera Foods, a commercial bakery in Toronto that hires exclusively through a temporary agency. Three temp workers have died at Fiera Foods or its associated facilities since 1999. In September 2016, Amina Diaby, who had worked there only two weeks, died when her hijab was caught in machinery. Quickly following the release of the story, Fiera Foods was fined $300,000 for the workplace violation that led to Diaby’s death. But the story doesn’t end there. The violations exposed at Fiera are both tragic and typical in our province. “Temp Nation” extends far beyond just one bakery and we cannot be satisfied to expose one bad employer at a time. Too many workers will be injured or killed as we tip toe in the direction of decent work. Temp workers need changes now! Our current labour laws allow appallingly unsafe and unfair work conditions to exist for thousands of vulnerable temp agency workers across Ontario. We are depending on the Ontario government to make amendments to Bill 148 that directly address the many hazards faced by temp agency workers. Temp workers deal with a lack of safety training, unpredictable scheduling, being paid less for doing the same work as permanent workers, or not being paid at all. Health and safety risks could be significantly lowered if client companies were made jointly liable with temp agencies for workplace injuries. Last-minute scheduling and denying hours to workers that assert their rights could be addressed through Bill 148. The Fight for $15 & Fairness campaign has been calling for 2 weeks advance scheduling, but Bill 148 offers the lesser provision of 3 hours pay if a shift is cancelled with less than 48 hours notice. We are working hard to ensure employers cannot use any loopholes to avoid their scheduling responsibilities. Equal pay is another part of Bill 148 we need to ensure has strong language and no loopholes if we are to make meaningful improvements for workers. Unless the language is changed to say “equal pay for comparable work,” there is transparency around wages, and the definition of seniority is amended to account for part-time and temp workers who have worked at a company for years, then workers will not be able to use this new protection against unfairness. Bill 148 needs more effective and stronger provisions for temp agency workers. The Ontario government must eliminate the incentives for companies to hire large numbers of temp workers at a lower rate of pay, to require them to do the riskiest tasks, and to keep them “temporary” for years on end. Temp workers should make up a maximum of 20% of a company’s workforce. Fiera is not the only company that hires exclusively through a temp agency. To ensure that temp work stays temporary, client companies need to convert a temp agency worker to a permanent worker after 3 months at the job and not just hire a revolving door of workers. All barriers preventing temp workers from being hired permanently must be removed. Help us push for changes by reminding the Ontario government of their commitment to decent work. In a Toronto Star article, Minister of Labour Kevin Flynn says the government wants to “get right to where the issue is… take away the incentive to use temporary help agencies, to stop the flourishing of this business.” Let’s hold our elected officials to their word: write to our Members of Provincial Parliament and send emails to Premiere Wynne. We can also include our voices in the media debate around labour law reform, and let the public know that the conditions temp workers endure are not acceptable. Write a letter to the editor and let your communities know how urgently Ontario needs a strong Bill 148 to be made law in 2017. With every one of us getting involved and joining our voices in the call for decent work, we can win fair scheduling, equal pay, and more.